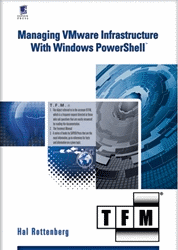 The absolute best book on managing VMware with PowerShell you will read this year. If you’ve been living under a rock for the past year or so, you’re probably very familiar with PowerShell and already knew that Hal Rottenberg is writing the seminal literary masterpiece on managing VMware with PowerShell. If you’ve been enjoying fresh air and sunshine instead, you should know that SAPIEN Press is offering $100 and a free copy to all qualified reviewers. Check out Hal’s blog for all the details. Update: Hal has got all the reviewers he needs. This entry was posted in Uncategorized on July 25, 2008 by Carter Shanklin. I’m afraid they are all full up! Thanks to everyone who applied.